"Falldown is the one book today that should be mandatory reading for all British Columbians." 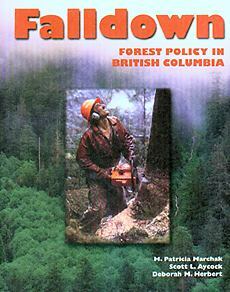 Falldown provides an in-depth report on the implementation and failures of the forest tenure system that defines rights to extract timber from the public forests of British Columbia. Illustrated by Ecotrust Canada's sophisticated mapping capabilities and sprinkled with numerous graphs, the book analyzes mill capacities, employment trends, First Nations treaty rights, and the real costs of liquidating old-growth forests. Reform proposals offered by each of the interested parties are discussed in detail. "The 'falldown effect,' the decline in timber production as the old growth is depleted, is promoted as if it were a natural phenomenon when it is, in fact, a stunning admission that the forests have been drastically over cut every year since modern forestry was implemented in the 1940s." The Allowable Annual Cut (AAC) allocated by the Ministry of Forests to tenure holders is substantially higher than the Ministry itself deems to be economically sustainable. By Ministry calculations, there is insufficient timber to sustain the level of logging currently undertaken, even if all other values of the forest are ignored. The AAC provisions in the Forest Act prevents companies from reducing their cut when there are changes in markets, utilization standards or other technological changes, species, or other conditions that make a previous level of logging excessive. Neither governments nor companies holding long-term replaceable tenures have adequately restocked logged-over forests. There has been an absolute decline in number of workers in all three sectors of the forest industry since 1980, in spite of an increase in volume of logs, sawn lumber, and pulp produced. Studies should be undertaken to determine how much manufacturing capacity of the kind currently established can be supported on the basis of ecosystem-based forestry. Where excess capacity exists in a region, government should undertake negotiations with companies that have replaceable tenures, to establish a level of fair compensation in return for a closure of facilities. Overcut in British Columbia, Based on TSA and TFL Data, one of the maps published in Falldown, is available on Inforain. 1. What Is the Forest Tenure System? Professor Patricia Marchak is President of the Humanities and Social Sciences Academy of the Royal Society of Canada, a member of the B.C. Forest Appeals Commission, and member of the Board of Governors, the University of British Columbia. She is the author of numerous books and articles on forestry, fisheries, and political economy.